I call the Bersa Thunder 380 an underdog because this little gun has fought so hard to overcome a myriad of negative opinions and stereotypes. Its caliber for instance is considered by many too small to have effective stopping power. Its magazine capacity is considered by many to be inadequate, particularly in light of the modern hi-cap pistol revolution. Others associate the Bersa with a whole class of cheap, low quality pistols of the same caliber. But as many underdogs do, the Bersa Thunder 380 has fought its way up and has managed to earn a reputation of being an effective and reliable little handgun. This Argentina based firearms manufacturer is an underdog story in its own right. The company survived decades of the country's political and economical strife to come out on top as one of the country's major civilian gun makers. Due to Bersa's success, Argentina has become the second largest arms producer and exporter in Latin America. The Thunder 380 is quite popular in many Latin American countries particularly where the .380 Auto cartridge is the largest allowed for civilian use. 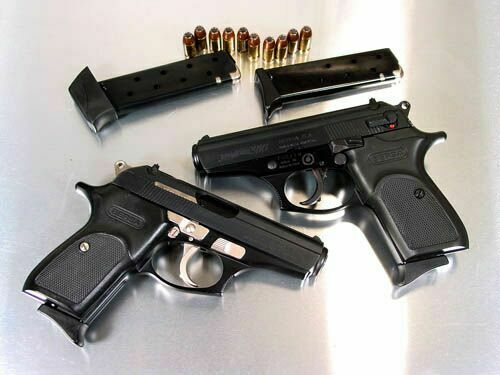 Additionally, a number of military and law enforcement organizations have included Bersa 380's in their arms inventories, including the Ecuadorian Air Force. 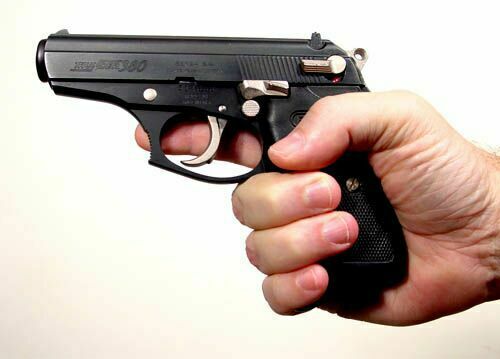 In the mid 1990's the pistol was introduced into the US market. Being a relatively unknown foreign import with an initial retail price well under $200, it is understandable that the gun's quality and reliability would be questioned. Many looked at the Thunder 380's low price and immediately associated it with cheap US made guns like Jennings-Bryco or Lorcin. But in my opinion this gun has a lineage that more resembles reliable foreign imports such as Sig-Sauer, Walther or Tanfoglio. Bersa has now also jumped into the 9mm and .45 Auto markets as well. While these larger caliber models face much tougher competition from a plethora of well established quality handgun manufacturers, the Thunder 380 holds it's own in this niche moderate-caliber class. First, I would like to address the issue of the pistol's caliber. Many people don't consider the .380 Auto an effective defensive round. My response to that contention is that "it depends". Indeed the .380 Auto is a light round compared to a .45 Auto. But, it is by far more potent than the .22, .25 or .32 caliber. As far as stopping power is concerned the .380 Auto caliber has always been on the edge of the penetration-versus-expansion trade-off. Where a solid full metal jacket round may get you effective penetration, the wound diameter might be too small and clean to immediately cause deterrence. A hollow-point round may expand to create a more traumatic wound diameter, but it comes with the cost of reduced penetration. Now, I can look at this issue from many different perspectives. For instance while I am certainly looking for "stopping power" in a defensive weapon, this doesn't necessarily have to equate to "killing power". An expanding round that can inflict a painfully traumatic wound without necessarily fatal penetration might be an effective deterrent that both I and the person I shoot could live with. Another way to look at it, eight 90-grain projectiles that you can fling at almost a thousand feet-per-second all within ten seconds or so are going to have some havoc wreaking potential whether they be solid or hollow-point. Additionally, we can look for the ammunition manufacturers to be constantly tweaking the cartridge to get the maximum performance from the caliber. For instance, Cor-Bon has recently introduced the .380 DPX cartridge. This is a standard pressure load with a special 80-grain all-copper-alloy hollow-point bullet that has exceptional expansion, while still meeting the FBI's minimum effective standard of twelve inches of penetration. The term "DPX" means Deep Penetrating X-bullet. When it comes to caliber size, it ultimately depends on one's own personal preference and comfort level. As for me, I feel quite confident that I can defend myself with a good .380 semi-auto. But I will admit that it is the smallest caliber I would consider for self-defense. Now on to the gun itself. 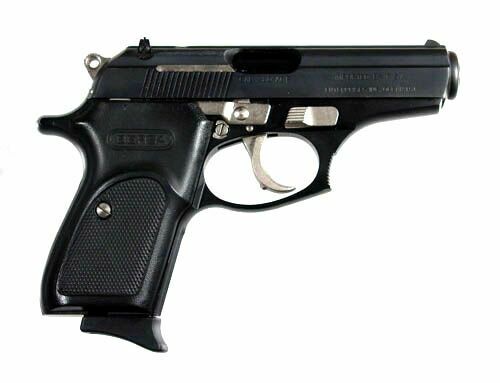 The Bersa Thunder 380 is an aluminum frame double-action blow-back operated semi-automatic pistol that combines style and features found in its .380 caliber cousins, the Sig-Sauer P232 and the Walther PPK. Like the PPK the Bersa Thunder has a standard thumb accessible magazine release just behind the trigger near the top of the frame. 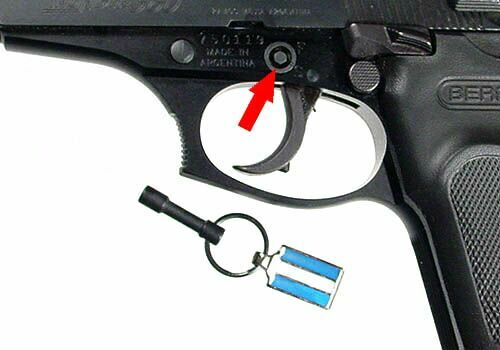 It also has a slide mounted decocking safety lever like the PPK, although Bersa also adds a trigger disconnect to the decocking lever. Like the Sig-Sauer the Bersa Thunder has a rocker style extractor and easy-to-see 3-dot sights. Unlike the Sig-Sauer though, the Bersa's rear sight can be adjusted with a simple turn of a screw. 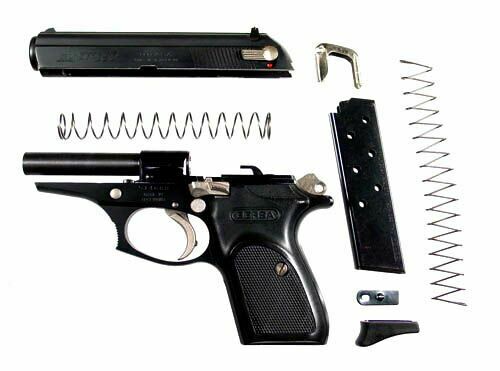 As with all blow-back operated semi-automatic pistols the Bersa's barrel is fixed to the gun's frame. The gun's slide recoil spring surrounds the barrel eliminating the need for a spring guide rod and reducing the slide's overall height. This recoil spring design is used in every .380 caliber pistol that I have seen. One of the things that has always aggravated me with both the Sig-Sauer and Walther is their small tang. After a day at the range with either of these guns I am guaranteed to come home with some slide bite. 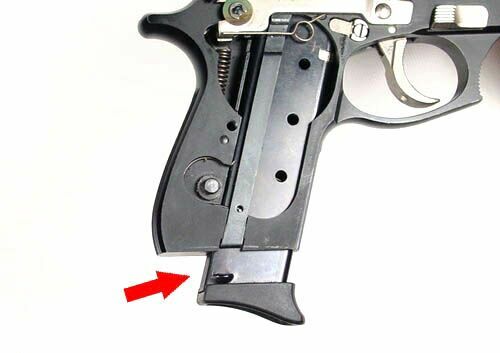 Bersa has eliminated this problem by slightly lowering and extending the tang on the Thunder 380. 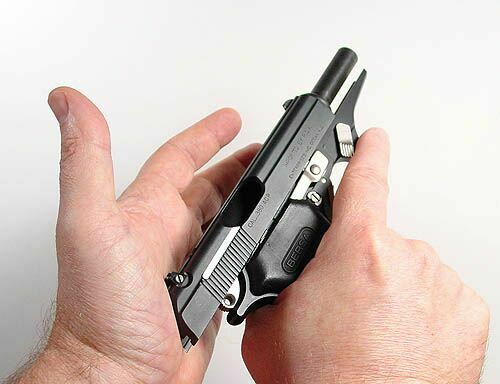 The Bersa's standard plastic grips have ambidextrous thumb rests, although none of the controls on the Bersa are ambidextrous. One control that is on the Thunder 380 that I have not seen on any other .380 Auto model is a slide-lock lever. The front and back straps of the Bersa's aluminum frame are finished with eight vertical grooves while the front of the trigger guard is finished with ten horizontal grooves which form a trigger finger rest. The top of the slide is finished with a fine cross-hatch pattern to reduce glare. The seven round single-stack magazine is constructed from steel with a polished black finished. The follower is also made from steel. The base of the magazine forms a finger extension for the grip. 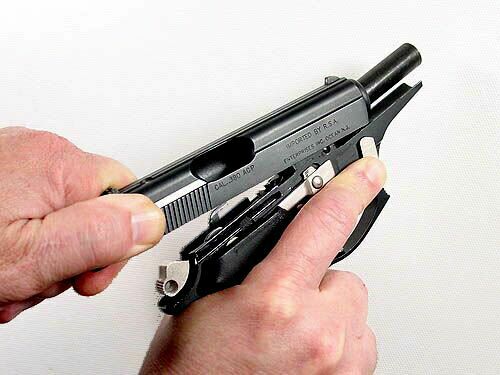 When the magazine is removed from the gun the trigger is disengaged, keeping the gun from firing any round that may still be in the chamber. Except for the plastic grip panels and finger extension the gun is constructed from steel and aluminum parts. The Thunder 380 is surprisingly fit and trim. The gun is tight, without the slightest rattle when shaken fully loaded. Parts fit together quite well, although with one of the models we received, the decocking lever was a bit stiff. We disassembled the decocking assembly, re-lubricated and reassembled it. We then worked it a few cycles and it loosened right up. The decocking assembly was quite easy to to disassemble and reassemble. There is plenty of room between the grip's tang and finger extension for even a large hand. The gun's mass is evenly distributed through the frame, which helps to transfer recoil energy down into the hand rather than kicking the barrel up. This reduces felt recoil which makes for quicker target acquisition times between shots. The hammer's spur is rounded, skeletonized and knurled, and is very easy to draw back with the thumb. Double-action trigger pull was measured at eight pounds, while single-action pull was just under four pounds. Trigger pull length for double-action was three quarters of an inch. The trigger had an eighth of an inch of take-up in single-action mode with the sear tripping within the next sixteenth of an inch. The white three-dot sights are proportional, with the front sight's dot being slightly larger than the two rear dots. Since the front sight is farther away than the rear sight when viewed through the aim point, all three dots appear the same size when they are aligned. As insignificant as this might sound, having the three alignment dots appear the same size really helps improve sighting accuracy. The gun disassembles and reassembles easily for cleaning and maintenance. No tools are required unless you wish to remove the grip panels, in which case you will need a flat head screwdriver. The gun is a simple joy to shoot. 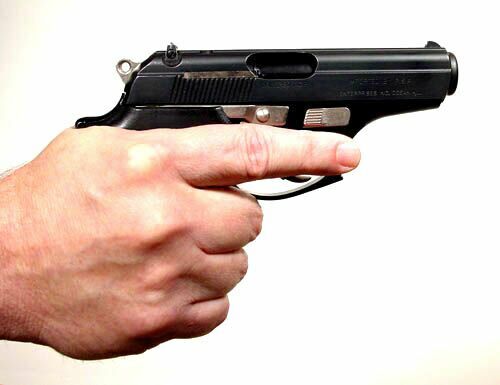 When fired, the gun has a reasonably loud report with surprisingly low felt recoil. The white 3-dot sights make target acquisition quick and accurate. Two hundred rounds were fired during the review of this gun without a single miss-feed, failure-to-fire or jam. All target groupings were consistent and surprisingly tight. The surprising little .380 caliber semi-automatic underdog from Argentina. While the thumb rests on the Bersa's grip panels are ambidextrous, the decocking lever and magazine release button are not. Adjustable rear sights. Rocker-style extractor. Lowered and extended tang. The gun is shown here taken down to its field serviceable parts. The Thunder 380 is taken down like most fixed barrel semi-automatic pistols. The slide stop lever is depressed, and then the slide is drawn back until it is clear of the frame's tracks. The rear of the slide is lifted from the frame and then allowed to slide forward until clear of the barrel. During reassembly the slide takes a slight "whack" from the heel of the hand, which snaps it into its closed position. Shown here is a brand new gun, and a gun that has had about a thousand rounds fired through it. The only noticeable signs of wear are where the steel slide touches the aluminum frame. Here you can see where the black anodized finish has been worn from the frame where the slide rides back and forth during recoil. These wear points are not visible when the gun is assembled. A tab at the bottom right rear of the magazine presses up on a transfer bar when the magazine is inserted into the gun. 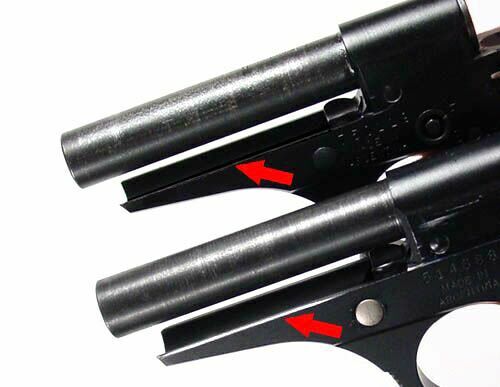 The transfer bar extends into the gun's action where it connects the trigger when the magazine inserted, and disconnects the trigger when the magazine is removed. Newer Bersa models are equipped with an integral trigger lock on the left side of the frame just above the trigger. An extended magazine is available (upper left) which adds two additional rounds to the gun's capacity.